While on display this week at the IMEX Show in the Gateway Canyon’s Resort booth, you can donate to the American Cancer Society. Donations above $100 allow you the opportunity to sign the truck that will be in the Baja 1000 race, donators under $100 will get a Driven to Fight Cancer wrist band. While the truck is on display at Saturday’s Cattle Baron’s Ball event in Dallas, Texas, there will be multiple Driven Experiences classes, Driven Rentals opportunities and Gateway Canyons Resort stays for bid at the legendary live and silent auction. “Cattle Baron’s Ball in Dallas is honored to collaborate with Driven Experiences and the Driven to Fight Cancer campaign to broaden our efforts to raise awareness and funds for cancer research,” said Jill Tananbaum, Cattle Baron’s Co-chair and American Cancer Society volunteer. You can participate with online support at www.cattlebaronsball.com/DTFC. Opportunities to pledge mileage donations can be placed through the Baja 1000 race on November 14th at www.cattlebaronsball.com/DTFC. 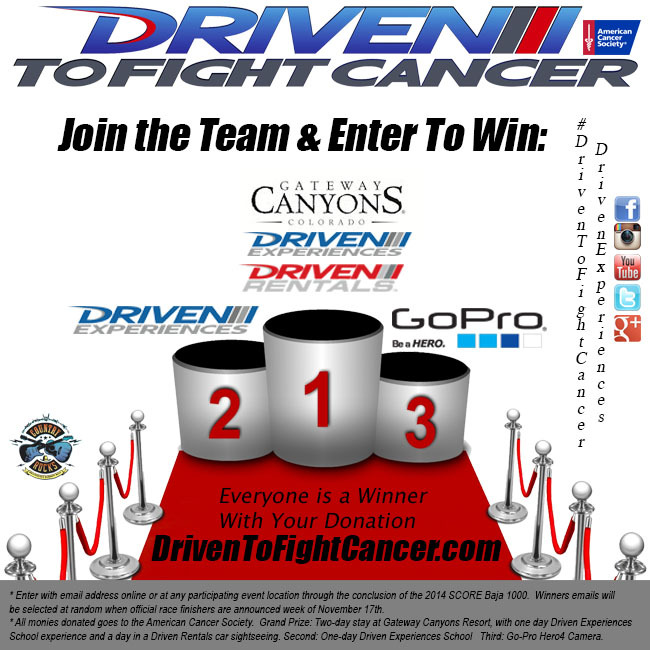 In the meantime, the Driven to Fight Cancer Trophy Truck will be on display raising awareness and money at the IMEX show in Las Vegas October 14th-16th, followed immediately by the Cattle Baron’s Ball in Dallas, Texas on October 18th. The truck will then go to the Specialty Equipment Market Association (SEMA) Show in Las Vegas November 4th-7th with qualifying for the SCORE Baja 1000 taking place on Tuesday November 5th in Las Vegas, Nevada. November 12th kicks off the week of SCORE Baja 1000 in Ensenada, Mexico. This will be a grueling race that Andrew Hendricks, Jeff Humberson and Chuck Dempsey will be teaming to win in the most experienced class in off-road desert racing. Race and event tracking will be available through www.facebook.com/drivenexperiences. Driven Experiences properly teach clients how to navigate off-road jumps, bumps and rough terrain on their 2-mile course located in Gateway, Colorado. Driven Experiences is the only arrive-and-drive school that provides the knowledge and information needed to really understand the profession of sitting behind the wheel of a Pro-Baja Truck. Driven Experiences is also offering offsite options of touring or racing through the Baja or California deserts. The classroom training starts based on any skill level and offers the full service opportunity to get the client to the finish line and into the winners circle. Gateway Canyon Resort is located an hour Southwest of Grand Junction, named the “Best Adventure Resort in Colorado” by “Best of TV” in 2009. In addition to the Driven Experiences opportunity, additional resort activities include: Dolores River Adventure, Horseback Riding, Off-Road Touring, Air Tours and a complete Gateway Auto Museum. 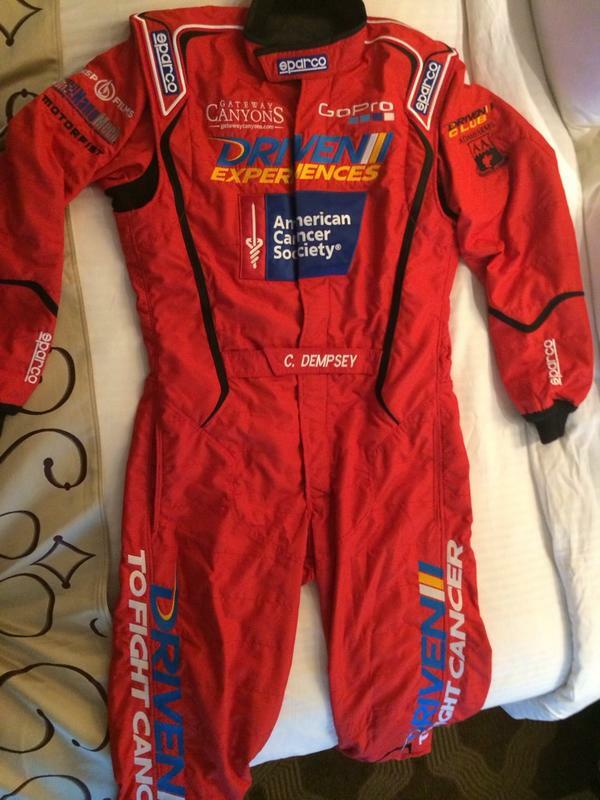 “The American Cancer Society is ecstatic to work with Driven to Fight Cancer and Driven Experiences. Together, we look forward to finishing the fight against cancer and celebrating more birthdays,” said Christi Erickson, vice president of corporate and distinguished partners at the American Cancer Society. The American Cancer Society is a global grassroots force of more than three million volunteers saving lives and fighting for every birthday threatened by every cancer in every community. As the largest voluntary health organization, the Society's efforts have contributed to a 20 percent decline in cancer death rates in the U.S. since 1991, and a 50 percent drop in smoking rates. Thanks in part to our progress nearly 14 million Americans who have had cancer and countless more who have avoided it will celebrate more birthdays this year. As we celebrate more than 100 years of service, we're determined to finish the fight against cancer. We're finding cures as the nation’s largest private, not-for-profit investor in cancer research, ensuring people facing cancer have the help they need and continuing the fight for access to quality health care, lifesaving screenings, clean air, and more. For more information, to get help, or to join the fight, call us anytime, day or night, at 1-800-227-2345 or visit cancer.org.